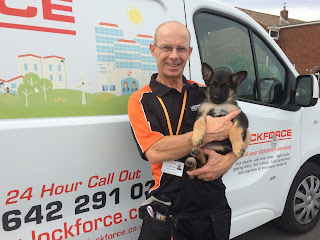 Here at Lockforce HQ we’re delighted to welcome aboard Alastair Mcleod and his new furry assistant Kayla! The new proprietor of our Redcar and Teeside branch comes to us following over 20 years service in the Navy. After completing our intensive training programme here at Lockforce, Alastair has now been out in the field for 6 days and has already picked up five rave reviews from satisfied customers!